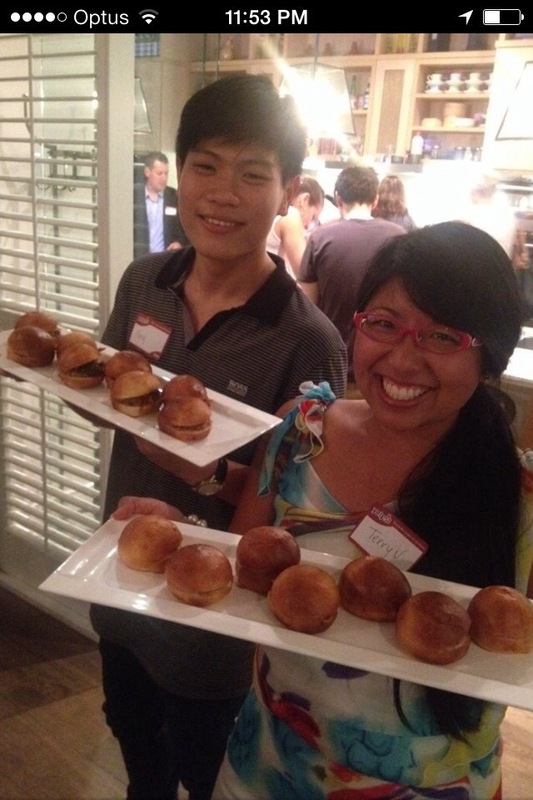 This month’s Yelp Elite event took us to the Spring Cooking Class. I am a huge fan as I had already been a few months back to learn how to make Australian cuisine that included kangaroo meat pies, damper, and pavlova. One of my favorite foodie friends, Fong, came with me and we had such a blast together! When we first walked in, it’s protocol to spot Lani for a Yelpy check-in and name tag. 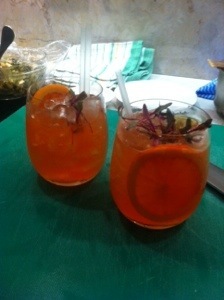 Then, we were offered an array of adult beverages including the special cocktail, the blood orange caprioska. Yum! I spotted Chef Mark in the kitchen and he waved me in to give me the biggest welcome back hug. He asked me how I was and if I was ready to get my hands dirty again. They divided us into two groups where half would make the canapés and then serve the other half and then vice versa. He has great energy and commands undivided attention when explaining how to make these don’t want to wait, just want to pop one in my mouth now canapés. I liked how he showed us how to make four ‘hot’ canapes and three ‘cold’ canapes because sometimes you just want to be able to throw a few things together or if you have more time to deep fry a few items, that is great as well! My favorite would have to be the pulled pork sliders with pineapple and pumpkin chutney! The key to a quality pork slider is to pull out the middle parts of the bread roll. The homemade rolls were so tasty (and made in-house might I add). We put them in the oven for about six minutes to toast them which was the perfect touch. The other tasty and hot dishes were the fried wontons with sweet chili sauce, white bean fillo wraps, and mini kangaroo pies. The pies were a little bigger than bite size and just perfect. The ‘cold’ canapes were fantastic too. We had wild poached salmon, chicken, and duck. This is so nice for bite sizes and you can make several. I loved all the ingredients that were combined. Duck with blueberry compote! Yum. The wild poached salmon was incredible. I thought they were quite easy to put together and would like to try them again. When we were in the kitchen, we were preparing all the food and serving the second group of Yelpers who were waiting to enter the kitchen. I thought that was a brilliant way to break up the group. Half of the attendees are able to prepare, present, and serve delicious cuisine. After everyone finished and was full, Spring gave us a little box of sweets to take home with us! The staff at Spring are just fabulous and the atmosphere was great. I can’t wait to go back again. I can’t reiterate how much I love the creative and unique elite events that happen with Yelp Brisbane! Thanks Lani! Check out photos of us cooking in action here!